The links are early this week as I’ve just realised I’m going to be away from my computer all day; this also makes them bleary-eyed and probably substantially less coherent than usual. In fact, I briefly thought I might actually still be asleep and dreaming this – the first thing I have bookmarked for the links is a report on England whitewashing Australia in the cricket, and I opened the newspapers to see most people reacting calmly to England losing in the football (well, except the Daily Mail, but it’s known that Mail readers require apoplexy like normal human beings require oxygen, so we’ll quietly ignore them). Anyway, to the links. When Raj Chetty wins the Nobel Prize in Economics, I wonder what the Nobel committee will cite as justification? They will be spoiled for choice. There’s the research on taxation and social insurance; his behavioural work (including one paper, which escapes me for the moment, where he proves the same point about anchoring effects of prices using both observational data and an RCT! ); and of course the incredible stuff he’s doing at the Equality of Opportunity project. He summarises his latest research on intergenerational mobility at VoxEU. It’s brilliant, and I cannot recommend it enough. He and his co-authors make novel discoveries about how inequality is transmitted across generations; they communicate these clearly and accessibly in both text and through diagrams; and they start to get towards what we can do about it. This is important economics, in every sense. Not every project is as glamorous as that, though. Ying Feng and co-authors do some heavy lifting to provide more evidence for a proposition that most practicing labour economists in developing countries have pretty much accepted for years, and one I’ve long-advocated in DFID, with success: unemployment is not really a relevant concept in developing countries. The intuition is basically that only the elites can afford to be without any kind of work in developing countries; for almost everyone else it makes sense to take whatever employment for whatever returns they can get, no matter how unproductive. They demonstrate how this pattern is precisely the opposite of what is observed in developed countries. More on the Stanford prison experiment: Vox publish an interview with the original researcher in which he defends its credibility. It’s a pretty awkward conversation, but does a lot to demonstrate both what was wrong with the study and what value it might still have. One thing about the World Cup: it is throwing up rather a lot of good incidental writing. Branko takes a trip down memory lane, remembering every World Cup he can recall, all the way back to 1962. It’s a lovely piece of writing, ending on a note only Branko would make: “Greek Olympics were held continuously for four centuries. Who will win the 2318 World Cup? Will countries compete?” FiveThirtyEight are in on the act, too, confirming what we all suspected – injury time is a complete and total travesty, bearing virtually no relation to the amount of time that actually should be added on the games (sometimes as much as 20 minutes!). 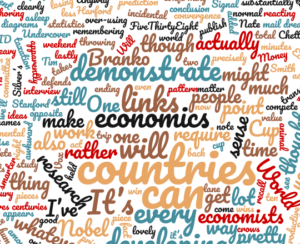 One for the non-economists wanting to learn more: Tim Harford lists his unconventional introductions to economics, though he leaves out his own Dear Undercover Economist, an excellent way of understanding how economists approach problems. I would also add Nate Silver’s The Signal and the Noise, about statistics and prediction rather than economics, but invaluable. Related: Planet Money compare Smith and Keynes, and come to the conclusion that they were both right (transcript). And lastly, two pieces that demonstrate convergence of intelligence in the animal kingdom: how people are over-using the exclamation point (this has been a problem for at least ten years, and appears to be getting worse); and crows are apparently even smarter than we thought, and can build things from mental concepts or ideas they have in their heads.